So far in the 1990s, there hadn't been that many rap hits by white artists. And what successful singles there had been came from acts like Vanilla Ice, Marky Mark & The Funky Bunch and, er, Bart Simpson. Not exactly that credible. That changed this week in 1992, with the debut of a hip-hop classic by a trio of white guys from Los Angeles. It was their only hit on the ARIA singles chart, but it's a song the group responsible have no doubt been able to live on ever since. Meanwhile, the song that has provided Billy Ray Cyrus with a nice retirement fund finally let go of the number 1 spot this week. Boyz II Men moved into the top spot with "End Of The Road" for the first of four weeks. The Donna Summer disco classic as it'd never been heard before - or since - thanks to UK rave act Messiah and former Eruption backing vocalist Precious Wilson. 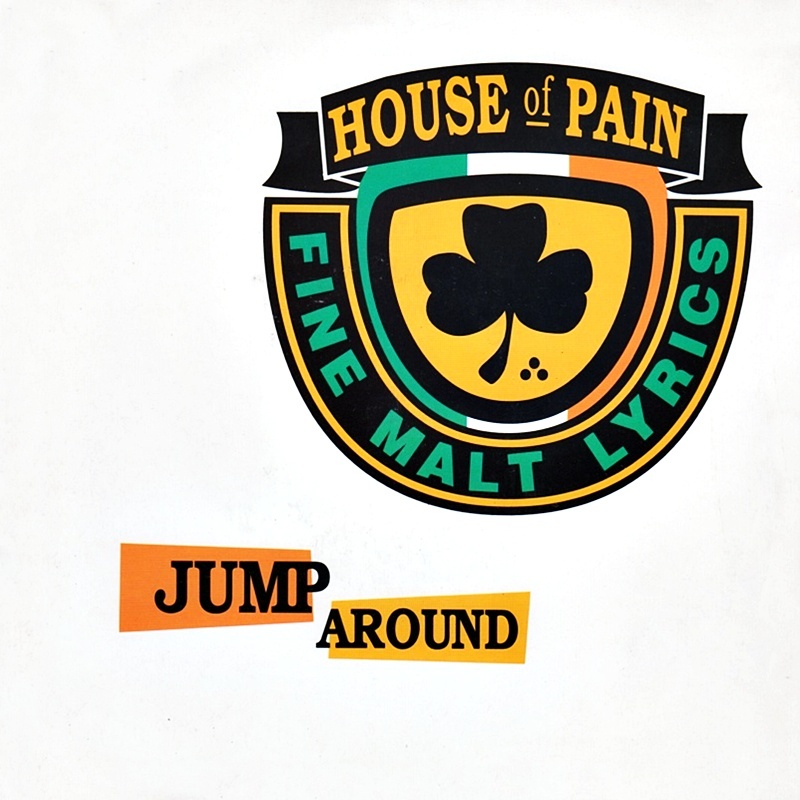 Stepping into the gap left by Beastie Boys, who hadn't been seen on the top 50 since 1987, LA's House Of Pain hit the ground running with their sample-heavy debut single, "Jump Around", instantly bringing some cred back to the concept of white rappers. 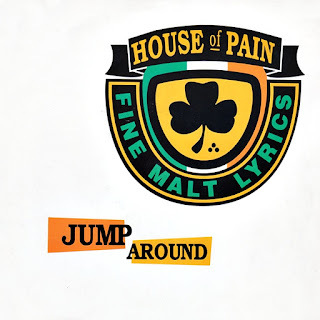 Sharing its exhortation to "jump, jump, jump, jump" with last week's arrival from The Movement, "Jump Around" is one of those songs that hasn't really gone away in the decades since thanks to continued use in TV shows and films, and at sports events. Nothing House Of Pain released subsequently would be anywhere near as successful and the trio split in 1996, with Everlast going on to a solo career and DJ Lethal joining Limp Bizkit, although they have reunited with third member Danny Boy on occasion. As we saw a few months back with Mariah Carey's remake of "I'll Be There", 1992 was the year MTV Unplugged really took off. And Eric Clapton's album from his performance did exactly the same, spending eight non-consecutive weeks at number 1 and a year inside the top 50. Worldwide, the multi-Grammy Award-winner is apparently the highest-selling live album of all time. Singles-wise, Eric released his Unplugged version of "Layla", a song he'd originally put out with his band Derek And The Dominos in 1971, and it became the biggest hit of his solo career in Australia. On the flip side was a version of his minor hit from earlier in the year, "Tears In Heaven", which would end up receiving double A-side status on the chart later in the single's run. INXS had released their own live album in 1991, but continued to struggle with the singles from their latest studio album, Welcome To Wherever You Are. 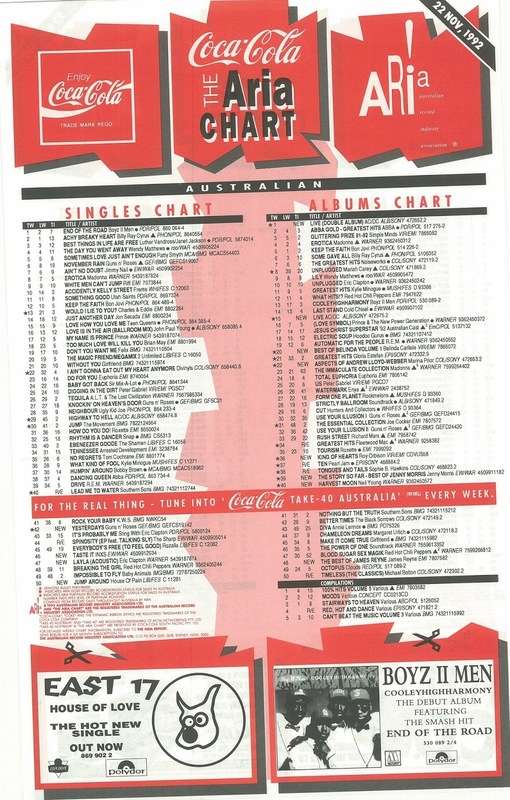 Third single "Taste It" was my favourite from the album and came with a video that was somewhat controversial at the time due to some racy scenes involving Michael Hutchence getting busy with a scantily clad blonde, but not even that was enough to push it further up the chart than number 36. For those keeping track, "Yesterdays" was the sixth single from the combined Use Your Illusion albums - this one was lifted from the second volume - and the sixth single to make the ARIA top 15. Not bad for a pair of albums that were already a year old by this point. And Guns n' Roses weren't done yet. Next week: the debut of a future number 1 single by an American act that was only massive in this part of the world. Plus, another soap star turns pop star and the song that provided the soundtrack for proms everywhere in 1992 (and 1976). I remember vividly as a kid watching Mrs Doubtfire & Jumping up & down to 'Jump around'. Great memories. 'Layla's was a great song by Clapto n, played live but doesn't beat 'Tears in heaven'. It's a fantastic ballad, for me it has held up extremely well & the inspiration was rather sad with his 4 year old son falling off an the balcony. I find it really old that 'Taste it' only reached #36, considering it was their best single if the album. 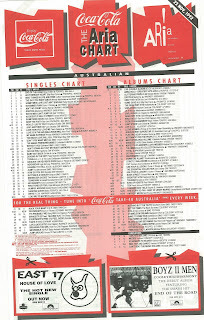 Another single 'Not enough time' didn't chart at all bizarrely & I liked that one too. Today marks Michael's 20th year since he passed. What a sad moment to reflect on..
'Not Enough Time' wasn't released as a single in Australia; that's why didn't didn't chart. Amusingly, rage mistook it for 'Time' (which that had mis-titled as 'It's Only Time') in 1994 and aired the 'Not Enough Time' video instead during the top 60.